Google was started in 1996 by Stanford University doctorial students Larry Page and Sergey Brin. They were working on the Stanford Digital Library Project, whose goal was to develop technologies for an integrated, universal digital library. It was funded through the National Science Foundation and other federal agencies. Larry Page considered for his dissertation the exploration of the hyperlink structure of the World Wide Web as an emormous mathematical graph. It is easy to see which web pages are linked to any given page as the hyperlinks are noted on the page. However, it is not so easy to work backwards and see which pages, if any, choose to link to any given web page. So Page focused on this problem after considering that this situation was similar to the role that article citations play in academic publishing and that knowing the number of such backlinks would be useful when analyzing a web page. Page called his research project BackRub and was soon joined by his close friend Sergey Brin. Page’s BackRub web crawler began exploring the World Wide Web in March 1996 with Page’s own Stanford home page serving as the starting point. BackRub began collecting lists of backlinks for any given web page it explored. Next, Page and Brin developed the PageRank algorithm to convert the gathered backlink data into a measurement of comparative importance by ranking the backlinks. They realized while analyzing the BackRub data that a web search engine based on the PageRank algorithm would produce better results than current techniques. Web pages with the most links to them from other highly relevant web pages must be the most relevant pages. This differed from other web search engines at the time, which ranked page results according to how many times a search term appeared on each web page. Their search engine originally used the Stanford web site google.stanford.edu, but google.com was registered by them in 1997. The name Google originated from a misspelling of googol, a number equal to 1 followed by 100 zeros. They formally incorporated their company in September 1998 at a friend’s garage in Menlo Park, California. By the end of that year, Google had an search index of about 60 million web pages. The Google search engine attracted a loyal following among the growing number of World Wide Web users, who liked its simple, uncluttered page design. In 2000, Google began selling advertisements based on keywords entered during a web search. The ads were text-based to keep an uncluttered design and a fast page load. Keywords were sold to vendors based on a combination of vendor price bidding and user click-throughs. Because of this successful business model, Google generated revenue while increasing its search index. In 2001, Google purchased the Deja News Research Service, an archive of messages that were posted to Usenet discussion groups that was started in 1995. Google then created a new interface and called it Google Groups, a free service that supports discussion groups, including many Usenet newsgroups. In 2003, Google bought Pyra Labs, the creators of the weblog publishing platform Blogger, first launched in 1999. This acquisition made many Blogger premium features free to use. After quickly outgrowing other places, the company leased a complex of buildings in Mountain View, California in 2003. The company has remained at this location ever since, eventually purchasing the property in 2006. The complex has become known as the Googleplex, from the word googolplex, a number that is equal to 1 followed by a googol of zeros. In 2004, Google bought two companies whose core technologies were transformed into Google Maps and Google Earth. First, Where 2 Technologies became Google Maps. Second, Keyhole, a geospatial data visualization company, had its Earth Viewer application become Google Earth in 2005 while other aspects were integrated into Google Maps. Google’s declared code of conduct is Don’t be evil, a phrase which was included in their initial public offering prospectus, believing that they will be better served in the long term if they do good things for the world despite forgoing some short term gains. 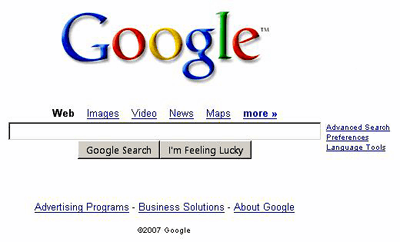 Google’s initial public offering took place in 2004. Over $1 billion was raised when the company offered 14,142,135 shares to the public (and another mathematical reference as 1.4142135 is close to the square root of 2) while another 5,462,917 shares were offered by stockholders. After the IPO, Google began to acquire companies that helped it develop various online services, many that were offered by Google for free. In 2006, Google purchased @Last Software after the company had developed a plugin for Google Earth. Co-founded in 1999, @Last Software was the developer of SketchUp, a user-friendly 3D design tool. It became Google SketchUp. In late 2006, Google made two large acquisitions that helped expand its online services. The first was the online video site YouTube and the second was JotSpot, a developer of social software for small- and medium-sized businesses. Google kept YouTube as a separate brand, but JotSpot became Google Sites, a structured wiki- and web page-creation tool where anyone can create a team-oriented site where multiple people can collaborate and share files. Also in 2006, Google launched Google Labs Spreadsheets. It was from its acquisition of 2Web Technologies and their XL2Web spreadsheet application. In the same year, Google also acquired Upstartle, the developer of a web-based, collaborative word processor, Writely. Together, their combined technologies formed Google Docs & Spreadsheets, later known as just Google Docs. In late 2007, a presentation program incorporating technology from Tonic Systems was added to Google Docs. Now, Google Docs combined the features of a word processor and a spreadsheet with a presentation program to offer users a free service containing a web-based office suite. Google Docs enables users to collaborate with each other while creating and editing documents online.